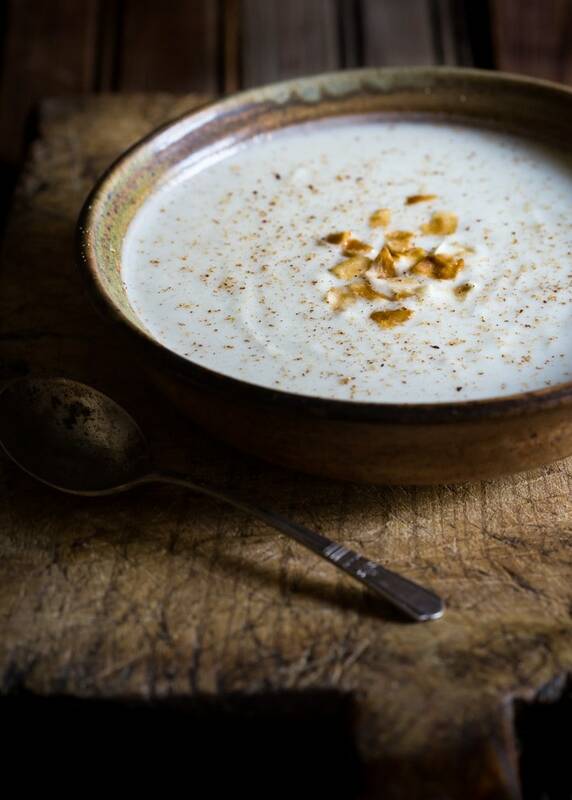 Creamy Paleo Cauliflower Soup with Coconut Milk with a hint of nutmeg! it’s Gluten Free and Dairy free, Vegan option, Paleo, and Whole30. Most soup recipes are very forgiving so even if the vegetables are a little past their best you can still make a great pot of soup with them. But you know what elevates soup from good to great? Now I know that you won’t always have that on hand so the next best thing is to use the best vegetable or chicken stock you can find. The Kitchn looked taste-tested to find the best vegetable and chicken stocks. Their top picks were Imagine Organic Low-Sodium Vegetable Broth, and Trader Joe’s Organic Chicken broth for the top spot and Swanson Natural Goodness 33% Less Sodium Chicken Broth in second place. There are also some nice bouillons out there, but I’ve found it hard to source a good gluten free version locally. 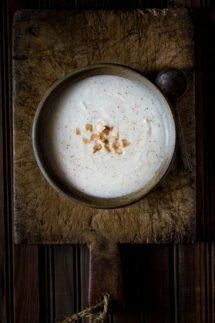 Cauliflower soup, it has a creamy texture even without adding any cream or milk to it. I don’t always follow a recipe for soup but when I make cauliflower soup I always, always add nutmeg. It might seem like an odd addition to a vegetable soup but just a little grating of nutmeg adds a really subtle flavor which marries so well with the creamy cauliflower taste. Cauliflower soup has a naturally creamy texture even without the addition of cream or milk. 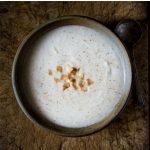 I’ve made various recipes for cauliflower soup over the years and if it’s a fairly simple recipe then I always add nutmeg. It might seem like an odd addition to a vegetable soup but just a little grating of nutmeg adds a really subtle flavor which marries so well with the creamy cauliflower taste. So if you’re sitting at home on a cold day and looking for a simple meal then this would be a great option for lunch or a light supper, it keeps well in the fridge for a couple of days and reheats very easily. It also freezes well so you can make it ahead of time if you need to. MORE SOUP AND STEW RECIPES! I have a couple more recipes that I think you’ll enjoy. First is my homemade Cream of Chicken Soup recipe. As someone who is gluten free and 99% dairy free (I can only tolerate very small amounts of dairy without issues) it’s been nigh on impossible to find any ready made ‘cream of’ soups that are both gluten and dairy free, so I made my own! It’s very, very easy, my only regret is that I didn’t make it years ago! I LOVE this Roasted Paleo Butternut Squash Soup with Apple, it’s such a warming soup, and naturally sweet too. And finally a couple of my more popular stew recipes, Gluten-Free Beef Burgundy and Paleo Chicken Stew with Kale and Dijon Mustard, they’re both very filling and some of our favorites! Add the oil to a pan and then warm on a medium heat and add the onions and cauliflower and stir for about a minute or two. Then turn the heat down to very low and cover the pan and sweat the vegetables for about five to ten minutes. Now add the garlic, coconut milk, and chicken or vegetable stock, then turn up the heat until it starts to simmer (do not boil), put the lid on and turn the heat down so that the pan will still be simmering with the lid on. If you want to add toasted coconut flakes then you can toast them on a low - medium heat in a dry nonstick or cast iron skillet, stir them all the time or they will burn! Cook with the lid on for about 15 minutes. Carefully add hot soup to a blender and blitz it until smooth. Add salt and pepper to taste, and a small grating of nutmeg. (optional) just before serving add toasted coconut flakes to garnish. Sheena – this is one gorgeous bowl of soup – the photo belongs in a magazine. It sounds and looks wonderful. Have a great week! Thanks Tricia! It tasted pretty good too! I’ll need to try that the next time Kacey! What an awesome combination – I love it! Gorgeous photos, too – love the warm earth tones with that cool white soup! Looks great! I really need to make more soup. I’m always amazed at how versatile an ingredient cauliflower is. This soup looks so rich and creamy. Love the idea of the coconut milk too. YUM! This is perfect for the fall! Love all the little touches in this soup, the creamy sweet coconut milk and then the grated nutmeg! Sounds delicious! I would be such a happy camper if I could soup every night for dinner. This one looks so simple and delicious! I can never get my cauliflower soup that smooth, you’re looks so velvety and perfect. Well done! This looks so good! Could it be made in a crockpot? I guess you could but I’ve never done it as it’s really quick to make on the stovetop.